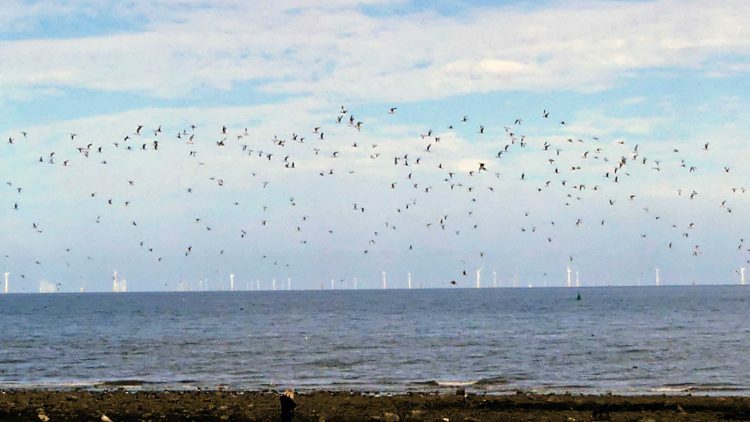 13.34- A sunny day with a strong breeze made it feel cold, but I was in need of some quick-fix fresh air and for that, Rhos Point is the perfect spot. 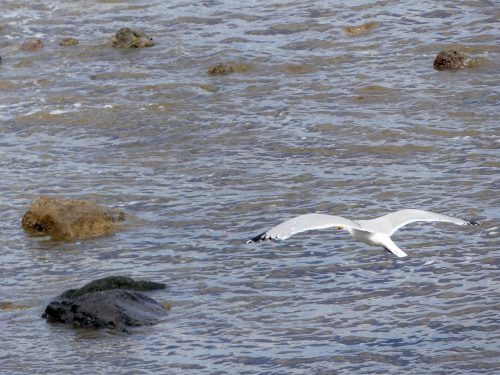 It’s also one of my favourite spots for watching wading birds, although I don’t visit it much during the breeding season as it is almost deserted by birds and becomes uncannily quiet. 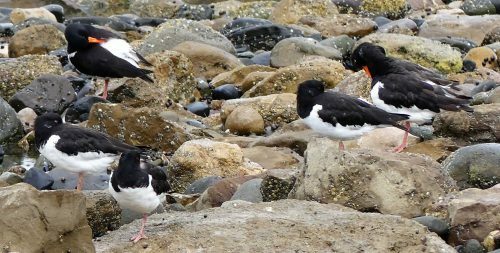 Today I arrived as the tide was coming in and I spotted a small group of Oystercatchers waiting patiently for today’s incoming lunch, so I waited too to see if they would be joined by others. 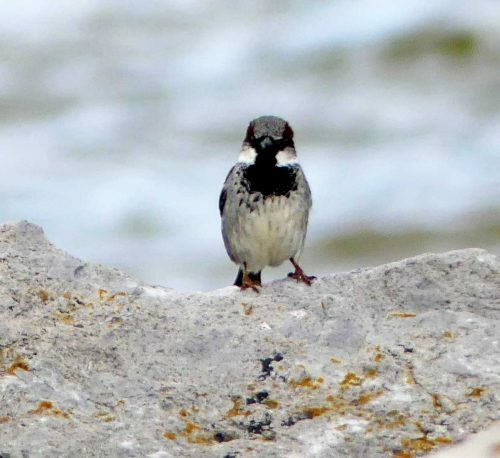 As I made my way down nearer to the shore I heard some lively chirruping emanating from a shrub that has taken hold on the promenade edge, then a few House Sparrows flew out and headed for the shore below to forage amongst the exposed rocks. 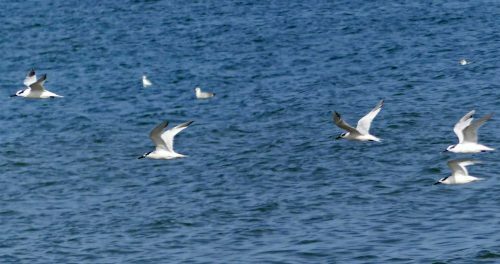 Two elegant Sandwich Terns flew low over the sea, close to its edge. 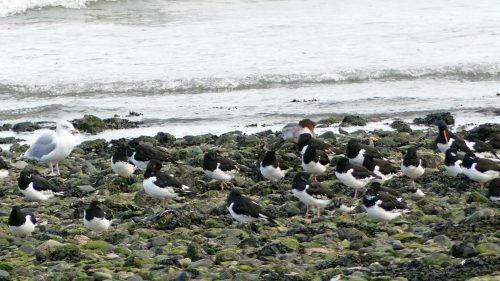 13.37 pm – Oystercatchers on the sea edge use the waiting time to rest or preen. 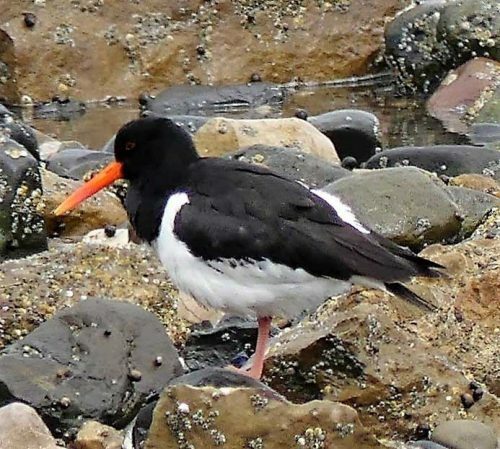 Oystercatchers are high on the list of my most favourite birds, they have great character and charisma and the more I learn more about them the more fascinating they become. 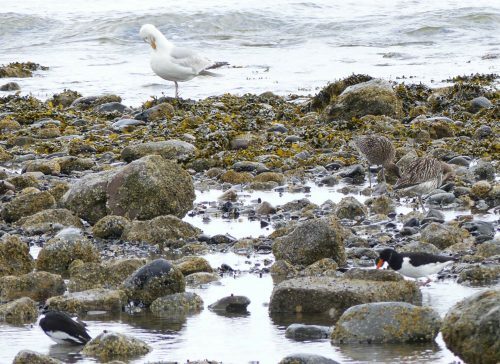 They are large wading birds and when not resting are noisy. 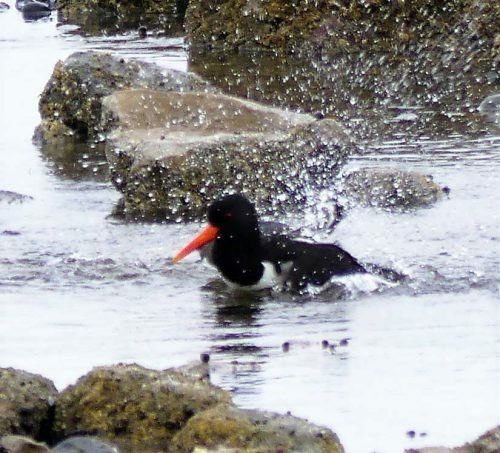 They sport large long orange or red bills, which they use for smashing or prying open molluscs. 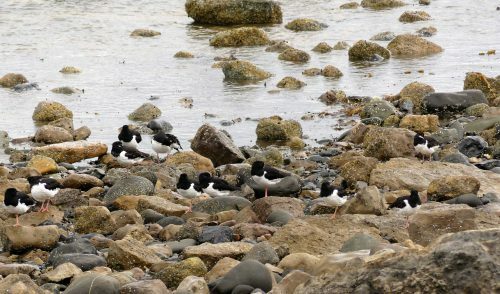 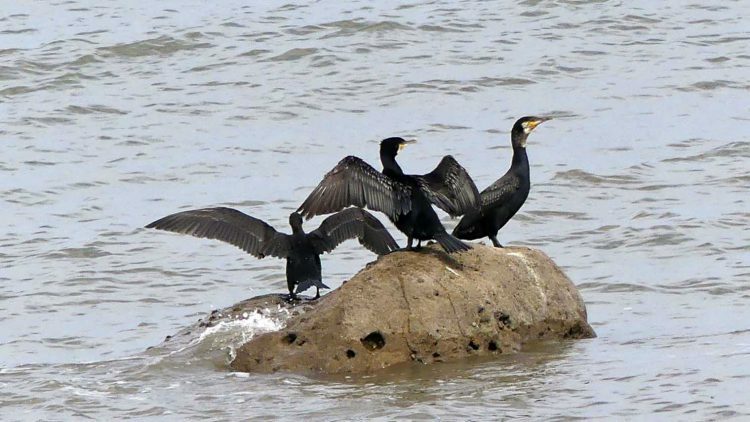 The diet of coastal oystercatchers is varied, although dependent upon coast type; on this rocky shore with its extensive mussel beds, they will prey upon mussels of course, and also on limpets and gastropods. 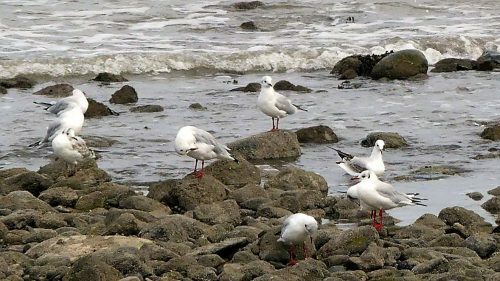 They also take advantage of whatever the tides bring in such as small fish and crabs. 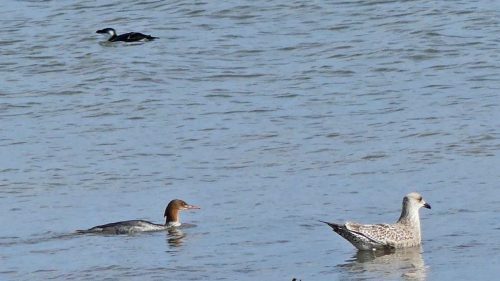 The bill shape varies according to the diet. 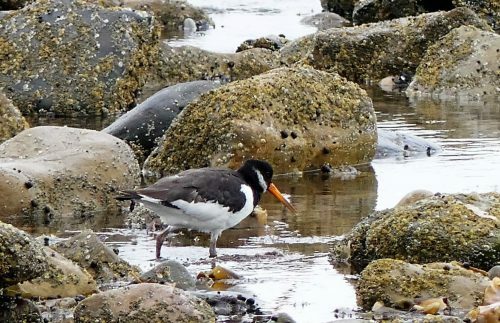 ‘Stabbers’ feed by jabbing their laterally compressed bill tips in between the valves of a mussel’s shell, while ‘hammerers’ crack open mussel shells by pounding on them. 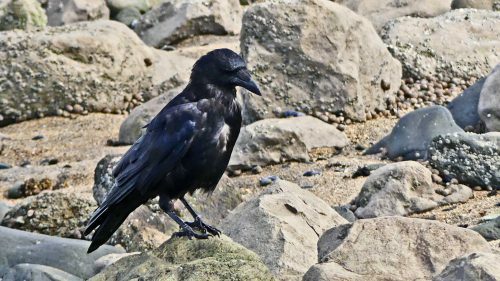 Those birds with blade-like bill tips pry open or smash mollusc shells, and those with pointed bill tips tend to probe for worms. 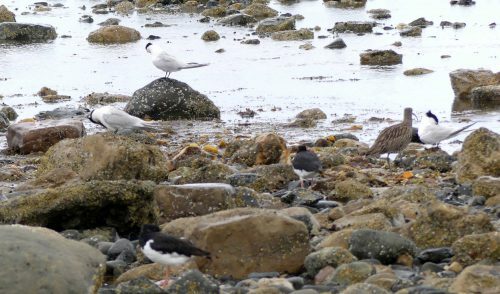 13.40 – The Oystercatchers were joined by a beautiful Sandwich Tern. 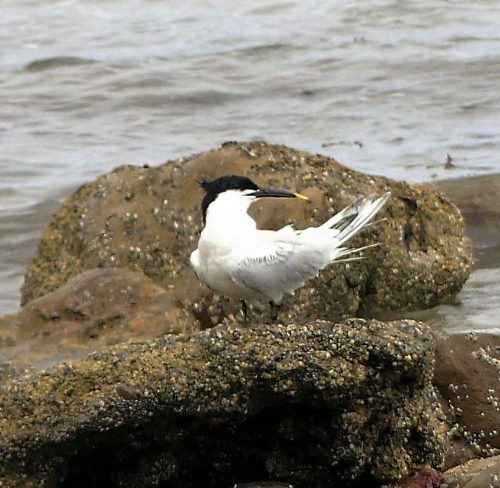 The Sandwich tern is a summer breeding visitor, returning to north-west Wales & Anglesey from late March to September. 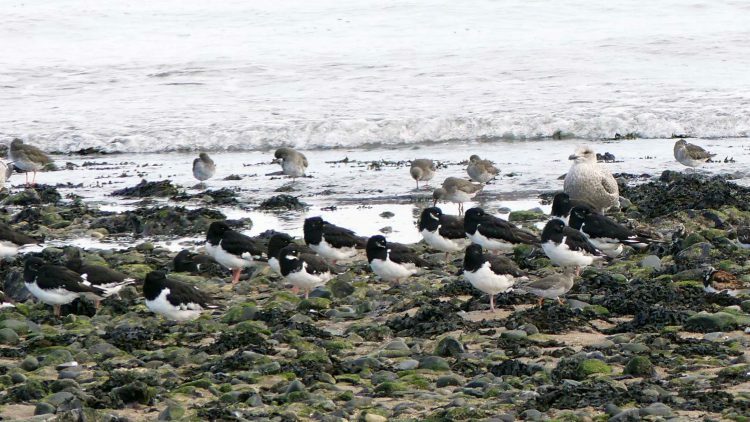 In the UK, many of the important colonies survive because they are on nature reserves. 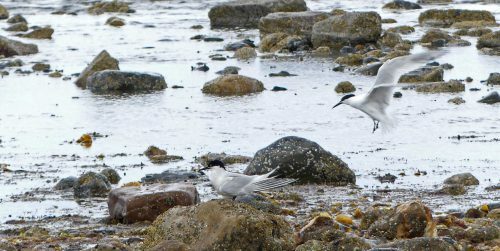 This is a very white tern, which in summer breeding plumage had a full black cap on its head. 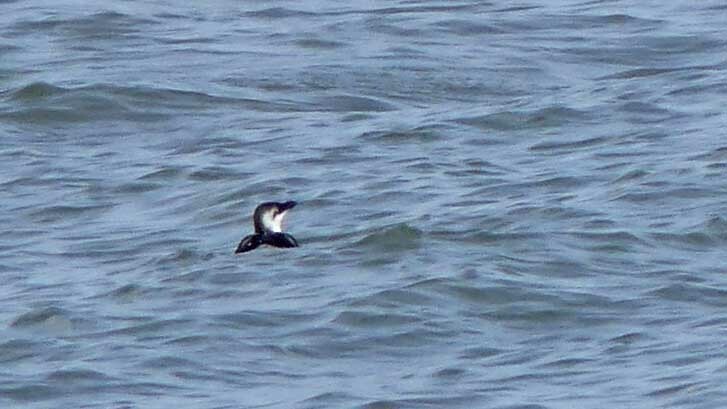 The bill is long and black with a diagnostic yellow tip. 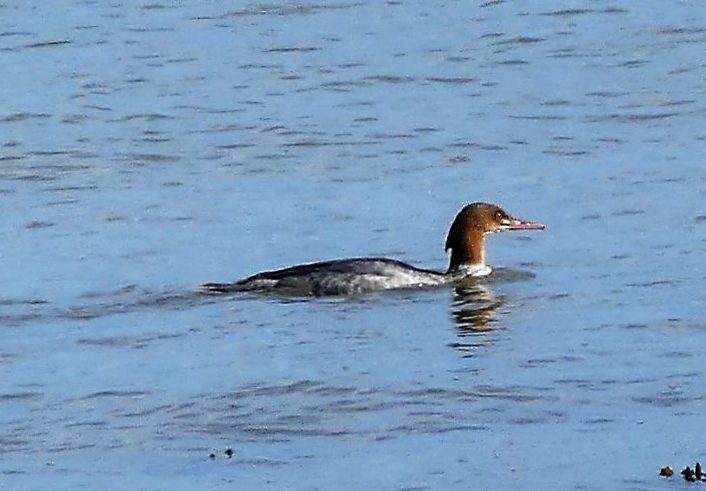 The legs are short and black and the tail short and forked. 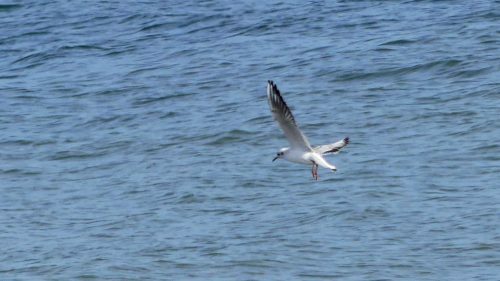 In flight it shows grey wedges on its wings tips. 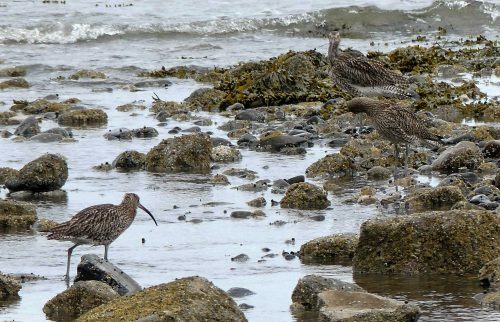 13.44- A small number of Curlews flew in to land on the rocky sea edge, where their cryptic plumage allows them to all but disappear. 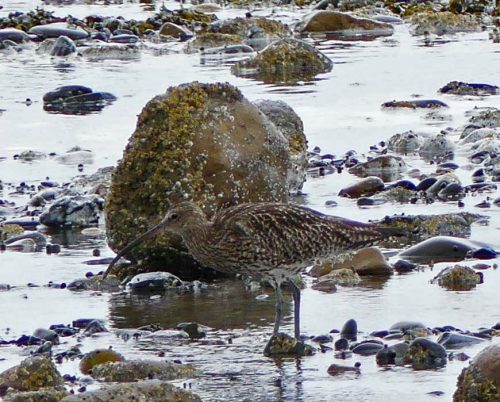 I took this short video as the Curlews arrived – coudn’t avoid the wind noise! 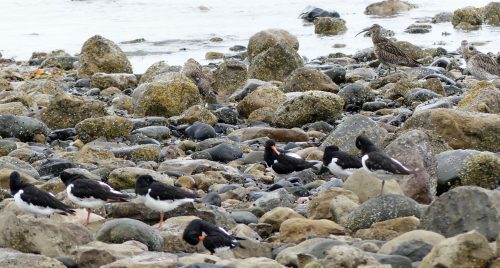 13.47- The mysterious moment that suddenly galvanises waiting wading birds into action arrived and triggered most, though not all of the Oystercatchers to begin foraging in earnest. 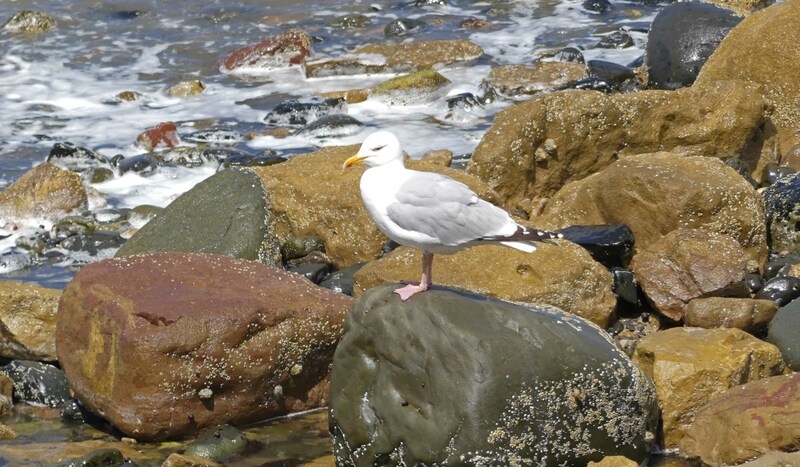 13.48- A Herring gull arrived to join the party. 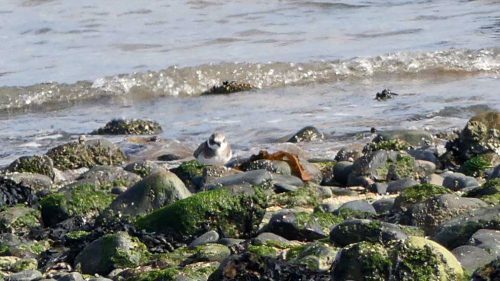 13.52- A second Sandwich Tern flew in, closely followed by a third. 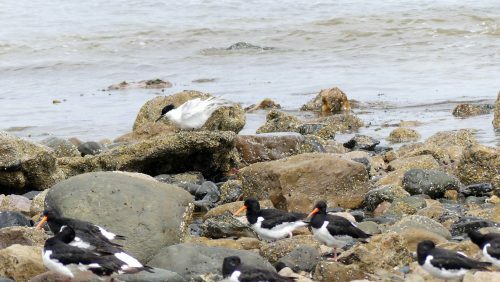 The terns also settled down to preen. 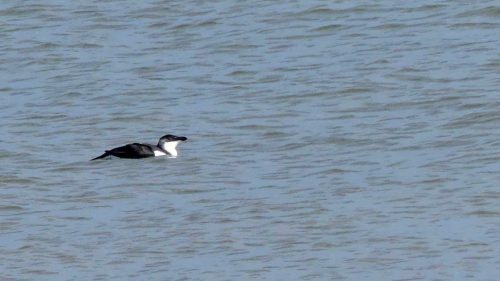 13.59- A Cormorant flew past at speed. 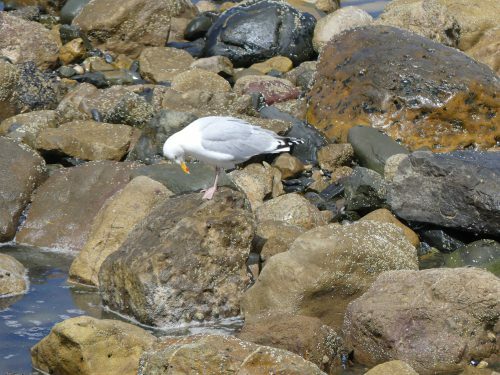 14.04- A Herring gull- it’s good to see them down here, where away from the rooftops, rubbish tips and promenades they are not upsetting anyone!